4.2 out of 5 based on 83 bloggers and 23 commenters. 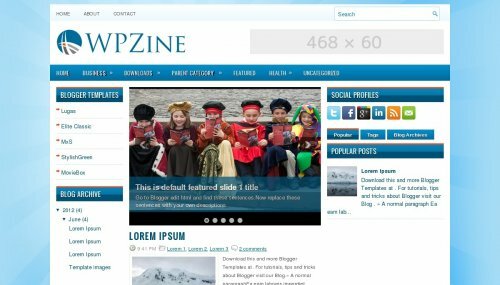 WPZine is a free blogger template adapted from WordPress with 3 columns, left and right sidebars, ads ready, footer columns, slider, social bookmarking icons, tabs, drop down menu and well designed threaded comments. I love light blue….In short I love this template. i like blue, thanks dear soo soo soo much. for this theme. Nice template I will use this in my new blog. I wanted to change this blue to #1589ff what should i change in html code? I take this also. You do awesome blogger templates! Me olvide de decir que es del WPZine gracias. thanks for the template, i like and i use on my blog. H, many thanks for your nice template. I am using it for my blog, and i noticed that in every post written the name of the writer disappeared. How can i fix the problem, in order to deserve the Google Autorship? I would love to use one of these templates. When I click download Im not able to open the files. Do I need to have a certain program for the files to open? nice template, I used it for my blog, thanks! same problem in my blog. hOME…ABOUT..BLA.BLA.BLA disappeared some days ago! How can I replace the images of slider with my own images? waowwww.. AMAZING.. !! !!!!!!!!!!!!!!! YahdikumuLLah! !